Cleaning your mattress on and off can reduce allergies and help you sleep better. Because this is not an easy job, we advise you to leave it to the professionals at our company who have been in the mattress cleaning business in Canary Wharf E14 for a long time. 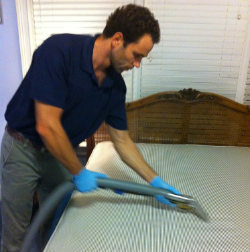 Here we use professional cleaning methods and cutting-edge equipment to remove dirt and mites from mattresses. We treat items with the best cleaning solutions that will not damage them. We produce great results. Our operators will be very glad to hear from you. We serve clients from Monday to Sunday. If you wish to book a service, give us a call. Thanks to our professional equipment, we can clean mattresses from deep within, eliminating pet dander, dead skin cells, dust mites, human hair and other particles. First we do vacuuming and pretreatment, then we follow up with a special deep cleaning program. Satisfaction is guaranteed. Our cleaning system allows that your mattress is cleaned on the spot and it produces very good results. We apply special solutions to deal with the contaminants that lurk in your bed. Our methods are safe and secure. When we finish cleaning, the item we have treated looks and smells good, and feels good to the touch. But more importantly, it is clean and disinfected. If you haven’t cleaned your mattress in a long while, we recommend you go for our company as soon as possible. We will bring it back to life in a few hours and help protect your health. We can be contacted 24 hours a day. It is best to call us if you want to learn about our service in detail. We want to help you. Don’t miss out on our mattress cleaning service in Canary Wharf E14. You will be happy you gave it a try.